VIP home personal training offers lady personal trainer and health coaching to our clients all over Dubai. The personalized service we provide will help you save time and energy. We come to you! Personal training with VIP is all about fitting in with your schedule at the location that suits you; whether you want to train at home, at the gym, indoor, outdoor, morning or evening. VIP Home Personal Training provides mobile personal trainers in Dubai to come and train you in the comfort of your own home. Personal trainer at home in Dubai for everyone, at any age. It doesn’t matter whether you have exercised before or not: we are here to start training you, step by step, until you reach your fitness and health goals. We offer different levels of training programs, depending on your fitness level and your specific goals. We have targeted programs for weight loss in different areas of your body; increasing your fitness level and strength, dramatically improving muscle tone (overall or in targeted areas of your body) and many more programs. We guarantee that you will start feeling the changes in your body after just two weeks. How can a personal trainer help me to reach my goals? Regular exercise has enormous health benefits and is important towards treating many common illnesses such as heart disease, diabetes, arthritis, and asthma to name a few. We need you to commit to keep going with the program and to follow the advice of our personal trainer. It may not be easy at first… but stick with it and the results will be well worth your effort! You will also start to look forward to your training sessions, as our other clients have. Dear client: The body composition analysis test is for free including your trial session. We conduct the test when we meet you for the first time. The body composition analysis test is a physical test that measures the proportion of the various components of a person’s body. The human body is comprised of water, protein, fat, and minerals — but for most purposes, it is the level of fat compared to lean mass that is of interest. 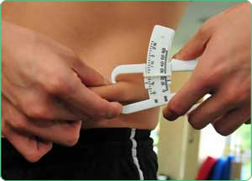 In general, most body composition analysis tests measure the ratio of fat to lean tissue.